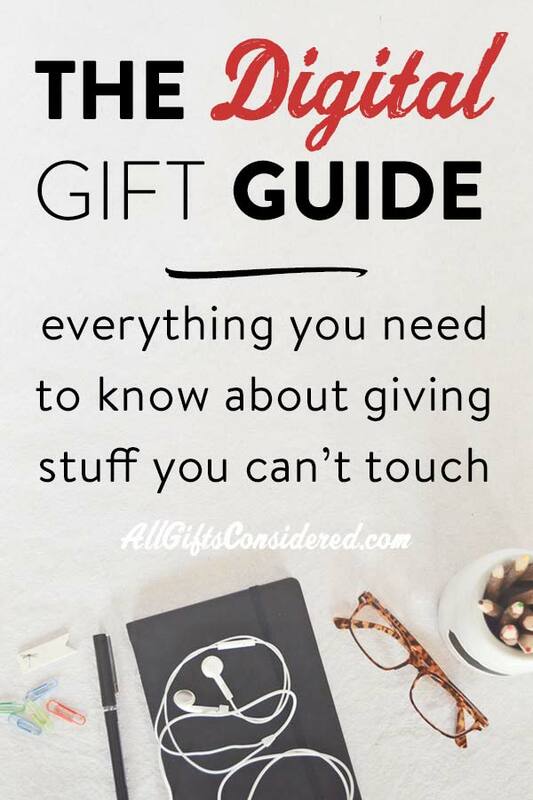 If you are looking for a Digital Gift Guide on how to give movies, music, audiobooks, ebooks, subscriptions, and more, this is everything you need to know. We’ll show you how to order and present a quality digital gift. Here is the outline of where we are going. Please note that this post contains affiliate links, which means that we may receive a commission should you purchase a product (digital or otherwise!) on our recommendation. See our full disclosure here. But first, a few words of introduction. Everyone is going digital with their movies and music. As they should – digital films and tunes take up no physical space, cut down on wasteful plastic, and can be played just about anywhere. Ebooks are another story; I’m an old-school reader from way back, so like many of my ilk, we generally prefer the print version. But that doesn’t mean I don’t like ebooks. On the contrary; the portability and accessibility is wonderful, freebies and 99 cent books are everywhere, and many readers have grown to appreciate or even prefer reading on smartphones and tablets. The fact that both printed and digital books sell well proves that there is room for both. Whatever your personal preference may be, the reality is that DVDs, CDs, Blu-ray discs, and paper books are getting replaced by digital versions more and more. So when you give a gift of entertainment, consider going digital. Digital books can be ready anywhere from a phone. Movies can be played on any device without having to insert a disc and wade through those antiquated menus and “warning” screens. Music can follow you wherever you go, at work, at the gym, at home, and on the go. Heck, most cars don’t even have CD players anymore. On top of all this, I haven’t even mentioned two of the main reasons people give digitally: time and space. By time I mean that digital gifts are great for last-minute gifting. On your way to a family Christmas gathering, and need a present for mom and pop? You can sit in their driveway and send a best-selling book to mom and that new movie pop wanted to see. Or maybe it’s 8pm on December 24 and you don’t have time to get anything for your Christmas buddy… except that you do. Bam! the new Bruno Mars album is scheduled for inbox delivery in 12 hours. By space I mean that digital gifts are perfect for sending something special to family and friends, no matter where they are in the world. No calculating transit times, no worries about running out of stock, no shipping costs, no customs duties or fees. Just a couple clicks and it’s done. So how do you go about giving digital gifts? 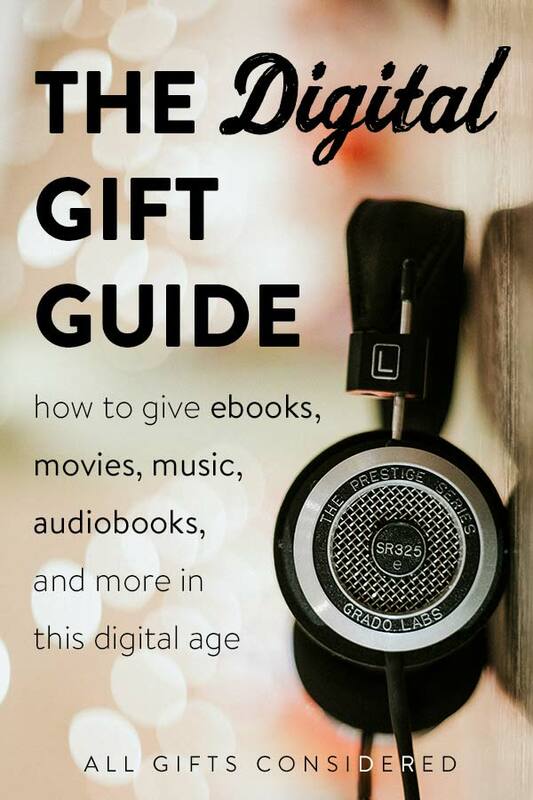 If you are choosing to give the gift of music, movies, or books, you will at some point want to know how to give ebooks, movies, and music digitally. You’ve come to the right place! This is the ultimate digital gift guide, showing you how to deliver your gift of choice through the cloud using one of the major media marketplaces. We’ll also look at ways to spruce up your gift so it doesn’t look like a lame-o last minute obligatory gesture. We will start with the presentation, then work backwards on how to actually order movies, music, ebooks, audiobooks and more as digital gifts. Let’s take a look at each of these options. This is a great way to let the recipient choose their own digital products. You can easily pick up a physical gift card for digital products at just about any store. iTunes, Amazon, and Google Play are popular options, and gift cards for their services are available at convenience, department, and grocery stores. Place it in a well-chosen card, write a note or simply sign your name, and you’re done. If you have chosen to give specific content – an ebook, movie, television series, or music album – then you can order it online, choose the delivery date, and enclose a receipt in a birthday or Christmas card. Or you can give a card that says a surprise gift is on the way, and let them know to check their email on the special day. This is where you can really make a digital gift shine. 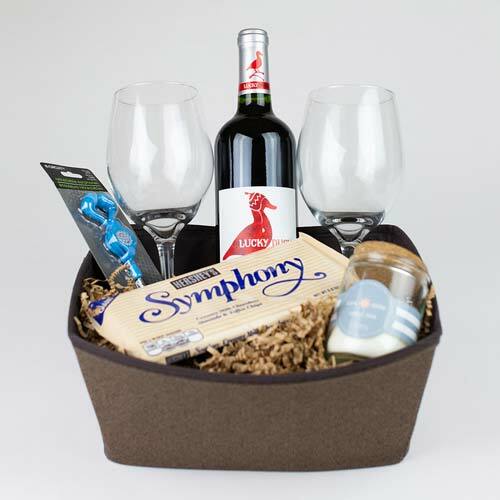 You can create a gift basket with ease, and choose whether to do it affordably or add some premium accessories. For the budget-friendly option, make a run to the nearest discount or dollar store. 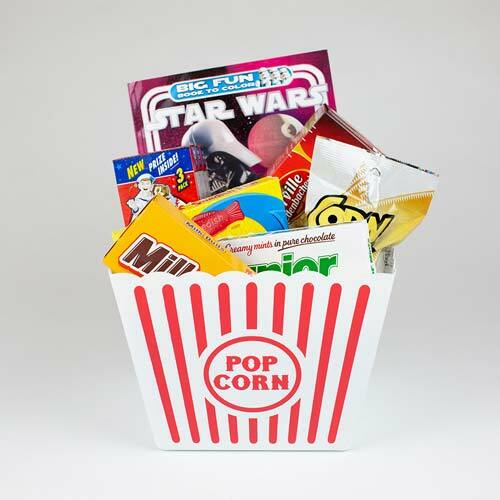 You’ll be able to find things like popcorn buckets to make the “basket,” plus goodies like microwave popcorn, a box of Milk duds, and a nice card. At most dollar stores, that’s just $4 to create a fun physical gift to go along with the digital one. And who knows, you may be able to find some Avengers toys to go along with the latest Marvel flick, a journal or reading light to accompany a book, or some crazy socks with musical notes to complement the gift of music. If your digital gift includes pop culture themes and characters, you can often easily find niche accessories. Storm troopers and Harry Potter are plastered all over stickers, cups, notepads, and more. Many superheroes and film characters can be acquired in action figure form. Shop around and don’t forget to use your imagination! If you want to do the premium option, nab a fancy woven basket or wooden tray and head to an organic market and choose some delectable goodies. Dark chocolate, coffee, organic popcorn, fruit, and chips made from colorful roots are all great snacks for a movie night. Wine, chocolate, coffee, and tea are always good choices for readers, while music gifts might go well with an exercise-themed gift basket (for upbeat tunes) or a spa-treatment basket (for the more sophisticated, relaxing artists). 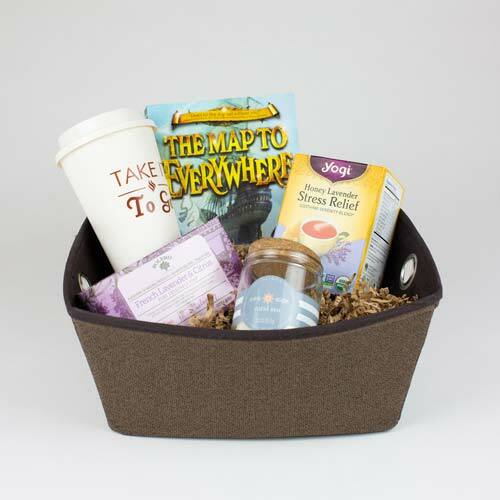 Here are a few digital gift basket ideas. Sending an ebook is pretty simple. If you have a PDF or epub download file, simply email it to the recipient. For most common platforms, here are the instructions. Find the book you would like to give, then click the Give as a Gift or Buy for Others button, which you will find somewhere below the traditional Add to Cart or Buy Now button. From there, you can send the gift directly to the recipient by entering their email address. Alternately, if you prefer to give the gift in person, choose the option to “email the gift to me” and Amazon will send you an email with a gift code. You can then print or copy the gift code into a card to give to the recipient. Similarly, to order a Nook ebook from Barnes & Noble you will need an account and valid payment form. Navigate to the book, select the Nook edition, and click “Send as a Gift with SmartGift.” Then follow the instructions. SmartGift is a creative method which allows you to order a book online (ebook or physical) and send a digital notice to the recipient. They can choose to accept the gift or exchange it for something else (of same or lesser value). Once they do, you get an email with the final selection and price and a link to finish the order. Follow the link, finalize payment, and the book will be on its way to the recipient. This method works perfectly for ebooks and also for last-minute physical book gifts. As with everything, you’ll need an iTunes account to send an iBook as a gift. Launch the iBooks app (or access via iTunes) from an iOS device and find the book you would like to give. Near the Buy Book button you will find a checkbox or dropdown menu with the option for “Gift.” Select that option and follow the instructions; you will need the recipient’s email address. Choose the date you would like your gift sent, then finalize the checkout. How to give digital audiobooks will vary by platform. Launch iTunes and navigate to the audiobook you would like to give. Near the “Buy” button you will see an option to purchase as a gift. Click that option and follow the instructions. This is Amazon’s audiobook department, and there is currently no way to gift digital audiobooks through Audible. You can, however, send a physical CD through Amazon’s main store, and you can give a subscription to Audible for 3 or 6 months, which allows the recipient one “credit” for an audiobook each month. There are many other audiobook services and platforms out there, and the popularity of each seems to change by month. Almost all provide the best deals when you subscribe as a monthly user, and they all typically offer the ability to give a gift subscription but not an individual audiobook. If the recipient loves a particular service, you should be able to go to that provider’s website and find the “subscribe” option. Nearby will be a “give as a gift” option, enter the recipient’s email address and you should be good to go. Movies are a great choice for a digital gift. It is pretty easy to find a movie someone already loves or would potentially enjoy, and two of the top three players in the digital media market make it very simple to send a digital movie as a gift. In iTunes, navigate to the movie you would like to give, then find the “give as a gift” button. Enter the recipient’s email address, proceed to checkout, choose when you would like it delivered, and complete the order. Easy. On Amazon’s website, find the film you are going to give, then choose the “give as a gift” option. Enter the recipient’s email address, proceed to checkout, choose when you would like it delivered, and complete the payment. At this time you cannot gift a movie through Google Play. Once the gift option is selected, enter the recipient’s email address, personalize with a gift message, and choose to send immediately or at a later date. Complete the purchase and your gift is ready. Find the album or song(s) you would like to give in the “Digital Music Store.” Beneath the standard “Buy” or “Add to Cart” buttons you will see a dropdown with more options. Choose “Give Album or Song as Gift” and follow the instructions. You will need the recipient’s email address, and there is also space to personalize with fields for To and From plus a text box for a brief gift message. Once you enter your gift note and details, proceed to checkout and purchase like you would anything else on Amazon. You cannot gift digital music through Google Play at this time. You can send a digital music subscription (see next section) or a gift card, but not the actual content. Digital subscriptions are also a great gift. You can easily give a year’s access to ad-free streaming music via Spotify or many other services. Netflix, Amazon Prime, and Hulu are popular staples for watching on-demand movies and television. Amazon’s Kindle Unlimited offers all the ebooks and audiobooks you want. In addition to these, there are online subscriptions for just about any niche interest. News, sports, and online gaming of all stripes are incredibly popular. Online magazines and educational platforms can be fun and exciting. And there are “member’s only” subscriptions for exclusive content from all sorts of publishers, producers, and personalities. Go to the digital publisher’s site and find the “subscribe” link. Many will offer the option for a gift, otherwise contact them and see what they can do. For many major subscriptions, you can use Subscribe with Amazon to pay for and manage your digital and physical content subscriptions. This is a pretty easy-to-use option for people who prefer the security of Amazon along with the ability to keep everything in one place under your account.